The identity of the writer of the most famous plays in the English language – credited to William Shakespeare – has been called into question as far back as the 19th century. Roland Emmerich’s film Anonymous explores the notion that Shakespeare lacked the education and familiarity with the royal court to have written such plays as As You Like It and Twelfth Night, and comes up with some interesting theories. The Earl of Oxford (Rhys Ifans) has been writing since childhood, but due to his noble background – and the beliefs of his family – cannot publish his work under his own name. In order to have his plays staged, Oxford offers money to Ben Jonson (Sebastian Armesto) to act as a front for these works. After a performance, as Jonson hesitates about taking praise for an anonymous play, actor William Shakespeare seizes the opportunity, and the credit for Oxford’s work. A theory is born. Anonymous is a film based on conspiracy theory, as opposed to historic fact, and this may anger some viewers. History is altered to suit the purpose of the film, the most obvious violation being the relationship between Oxford and Queen Elizabeth (Vanessa Redgrave/Joely Richardson). The politics of the late Elizabethan age come heavily into play and the film quickly switches from mere conspiracy theory into a dissection of relationships carried on behind closed doors. 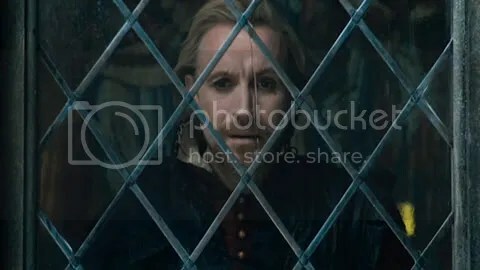 Rhys Ifans is wonderful as the glowering Earl who looks on from the theatre as his plays are performed. The characters complexity is well embodied in Ifans, including his secret desires for the Queen, and to write. Edward Hogg, as the Queen’s adviser Robert Cecil, is fantastically evil and manipulative but the stand out for the film is Rafe Spall’s wonderful William Shakespeare. He appears on screen for very little of the film, but his presence dominates; he is the man who has taken credit for these plays. Shakespeare’s drunkenness and lack of education go against him, and instead of everyone praising his work, the question is; is this really the writer? Where the film falters, however, is in it’s lack of clarity. A film that should be about the pen behind Shakespeare soon gets tangled up in the relationships at the royal court; Shakespeare nor his Rose Theatre appear on screen for much of the film. Instead of learning about the man William Shakespeare, we are presented with an alternate version of history where Queen Elizabeth I – the Virgin Queen – has several children by several different men, which manages to compromise the idea of Elizabeth as a feminist icon. In all, Anonymous needs to be shorter and clearer – a simple reminder of the year would have been appreciated as audiences could find themselves wondering why Elizabeth suddenly ages, then returns to youth. If it were not for the performances from the outstanding ensemble cast and the fantastically realised depiction of Elizabethan London (and the audience reception of plays at the Rose Theatre), Anonymous would falter. As it stands, it is a confusing but fairly interesting and beautifully realised film – albeit historically inaccurate – about the power struggle at the Elizabethan court. Shakespeare and the question of his authorship appears merely as an aside.